This is a continuation of my page about electric jackhammers and it is about pneumatic, or air operated jackhammer how to operate them. 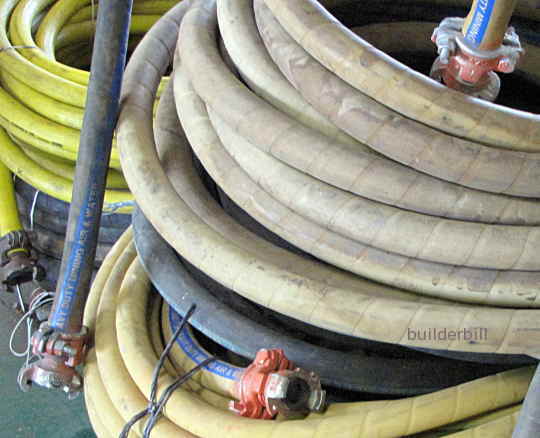 Jackhammer how to: A few coils of 3/4" air hoses. This is the smallest size hose for these tools, with a larger 1" also being available. The size refers to the internal diameter. So you can see that they have a thick wall. Photo taken with permission of Coates Hire.. I have had a question from Steve in the UK, asking if I have had any experience with the jackhammers used in road repair work. I have moved my answer here to a separate page as it could also be of use to other people who need a jackhammer or breaker for a longer job that would tend to put a lot of stress on an electric tool. "Steve, I have had heaps of experience with jackhammers and rock drills. I owned a Sullair 185 CFM screw compressor for many years. It had a four cylinder John Deere diesel motor. A beautiful piece of machinery. I ran mostly Atlas Copco tools." I have not only "been there and done that" but I have the Carpel Tunnel to prove it. In general, air operated jackhammers run off portable air compressors. Usually diesel driven and mounted on a dedicated trailer. The 185 tag after the Sullair means it delivers 185 cubic feet of air per minute. A full size jackhammer uses about 80 to 90 cfm so I could run two large ones, virtually none stop all day if I wanted to. That is the main difference between air driven and electric tools. Longer duty cycle. Others are longer life for the tool, and simply, just more punch, pound for pound. If you are hiring an air compressor and tools for the first time, get the guys at the depot to run you through the procedure. More than once if necessary, they would prefer to do it a few times rather than have to make a site visit for a simple oversight. On the inside of the compressor will be a list of daily checks, oil, water, fuel etc that you should do before you fire it up. Read it up and do it. Set the machine up level. If the compressor shuts down on it's own, it will probably be due to an overload cut-out (heat, oil pressure, filter etc. ).Get assistance in this case. Or it could be the obvious, it's run out of fuel. Please don't let that happen. In a lot of diesel engines it is a pain in the bum to bleed the system of air when you they out of fuel, but more than this, by dragging the last of the fuel out of the bottom of the fuel tank and any sediment that is there as well, you can clog up or at least reduce the fuel filter life. Start up with no load on the compressor. That is, have an open air valve with nothing connected to it. Normally the compressor will shut down if there is no pressure in the line, it won't roar away with no load. The electrical cut-out for this, has an override button which you have to press for a few seconds as you are starting up each time. This will all be detailed somewhere near the start panel. If the machine cranks over but doesn't fire up, usually you've forgotten the override button. So it's check your fuel, water, oil. 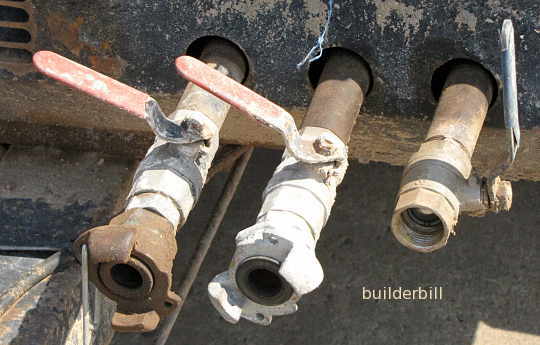 Open an air valve, one thumb on the override and hit the starter. When it fires up after it builds up to full revs, let go of the override and close the valve. The machine will drop down to a low no load idle. Please follow all the safety directions. I have a list here. From the same page but a point worth repeating. Break up and clean up as you go along. It gives the machine a rest now and again and a clean work area is a safer work area. Dragging hoses over a mass of rubble and sharp rebar ends is asking for trouble. It used to be common with all tools like these jack hammers to have an oiler bottle in the line. Usually fitted at the compressor end this metal fitting introduced a small amount of oil into the air line to lubricate the tools. In a lot of cases the compressor itself used to be worn enough itself to pass oil down-line. The problem with this is that the oil stays in the air and when the operator breathes in some exhaust air from the tool, he also breathes in a certain percentage of oil. If you see oiler bottles get them taken out. Modern air compressors do not pass harmful amounts of oil downstream and they also comply with other safety regulations like soundproofing. A good enough reason for anyone to only deal with reputable hire companies that have modern and well maintained machines. Jackhammer how to: The open and shut valves at the air compressor end. They are simple ball valves, shut when the handles are at right angles to the flow and open when the handle is in line with the flow of air. Jackhammer how to: A close up of a claw clamp. Unlike most snap on fittings, there is no male and female ends. They are all the same basic fitting that requires a bit of effort to compress the rubber seals and at the same time turn to engage the claws. The hoses from the machine to the jackhammers will be either 3/4" or 1" thick rubber with a claw type coupling on each end. These claw fittings need to be snapped home fully (with no pressure in the line). It is possible to get them half way round and think they are OK.
You can be working away and all of a sudden a blast of air, and the end of the hose is lashing about. It could give you a hell of a thump. 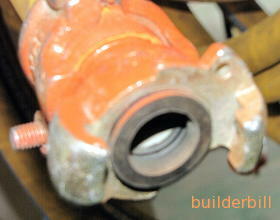 The couplings have provision for a spring clip to be fitted, to stop the coupling undoing accidentally. If these are available use them, even though they are a pain to use. Sometimes hoses just burst from old age, couplings blow off etc. The hose goes wild. Don't try to catch the end. Grab the hose away from the lashing about part and fold it in half to cut off the air supply. Then switch off the machine, or close the valve. To change the bit, or put one in, swing the collar / retainer to a side on position. It is spring loaded and may be stiff, if so belt it around with a hammer or a spare bit. Make sure it is snapped back fully closed before you fire up and start work. The actual operation of the jackhammers is simple. There is a lever on the top of one of the hand grips and if you press down it punches, ease off and it stops. The method of using the jackhammer. Go to this section of my electric breaker page for detailed instructions. The principal is the same. One last point, above all else, don't push the thing, let the weight of the machine do the work.